Are traditional modes of outsourcing in financial services dead and how are the giants of outsourcing adapting to the change? Like this whitepaper? Give it some love! Outsourcers are completely reinventing themselves. RPA. Blockchain. AI. Big data. Cybersecurity. The outsourcing landscape in financial services has changed significantly since we published our last trends report 4 years ago. We have witnessed and experienced this change first-hand from both perspectives, through the work we do with our financial services clients and with their outsourcing providers. Focus has significantly shifted from operating model design, sourcing advisory and ‘traditional’ models of outsourcing and offshoring, to helping organisations explore and benefit from the seismic shifts new technologies are driving. Previously distinct industries are seeing the lines that separate them increasingly blur. And the impact is profound. We felt the first tremors as banks finally started to explore the potential of cloud. New providers exploded the traditional modes of infrastructure and software support. Then, robotic process automation (RPA) started to transform how we thought about business process service provision. Now, financial services organisations are increasingly exploring how blockchain, artificial intelligence (AI) and big data are radically transforming how they do business. And importantly, what services and skills they will need to source from the market to deliver on this. The type of providers they are engaging with is diversifying. The big brand names of the outsourcing world are completely reinventing themselves. These new partnerships look very different to the traditional client-outsourcer relationships of old. New ways of working and new commercial mindsets are vital to delivering real value. In this updated report, you’ll find a comprehensive analysis of the latest trends facing the financial services outsourcing market. You’ll get an understanding of how these disruptive forces are shaping the future of the outsourcing industry. Or in some cases, entirely replacing it. We hope you find these perspectives interesting and that you’ll engage in this dialogue with us – I’d love to hear your thoughts and first-hand experience. Traditional models of outsourcing & offshoring have expired. ‘Mega deals’ ($500m+ transactions) once dominated the market. Today, we’re seeing a welcome shift toward a multi-sourced ecosystem model, bringing with it an explosion of new providers and solutions for outsourced services. Like every other industry, the power of partnerships in this age of disruption is paramount. Paradigm shifts have taken place. IT and business process outsourcing (ITO and BPO) offerings have converged. Providers are increasingly offering full-stack solutions that include the resources and the technology platforms required to underpin their clients’ business process requirements. The same technology revolutions impacting every other industry are driving these shifts. The services financial services organisations are looking for and the solutions their outsourcers are now providing are dramatically different. Across demand and supply, change throughout the industry shows no sign of slowing down. Thanks to the digital revolution, customer expectations have never been higher, and they’re only increasing. This means companies across all industries are asking their traditional outsourcers and upcoming new providers for help with digital development, as well as with new approaches like Agile and DevOps. Financial services is no exception. Cloud has cannibalised traditional modes of infrastructure. The era of big data and advanced analytics has given birth to a strong demand for a different set of capabilities from service providers. From rethinking data architecture, building new business insight capabilities, through to accessing the still scarce talent of data scientists. And, lest we forget cybersecurity is of the utmost importance following the explosion of digital channels and proliferation of data in the cloud. The huge reputational risk (not to mention financial fines) from any data breach is driving significant investment in this area across the whole financial services industry. New requirements for existing outsourced services, as well as the opportunity to offer new services are prolific. The ever-increasing plethora of new regulation that has continued to emerge since the financial crisis has increased accountability across institutions. In equal measure, it has put pressure on outsourcers to remain compliant. The demand is now strong for new specialised outsourcing technology solutions around compliance and regulatory reporting. Across the global outsourcing industry, financial services (FS) organisations continue to be the largest buyer, accounting for ~20% of the total market. Even though FS outsourcing has continued to grow over the past few years, the growth rate has slowed. This is a reflection of the market’s increasing maturity – many large corporates in developed markets have consumed outsourcing services as far as they intend in the near term. The market is expected to continue growing over the next few years, although the rate is expected to continue its decline. Over the next 4 years, growth is expected to be about 2% CAGR for ITO, compared to 5% CAGR over the previous 5 years. For BPO, 9% CAGR is expected, compared to 11% CAGR over the previous 5 years. But, any sense of stability or stagnation that these statistics might suggest belies the huge underlying shifts that have taken place in the FS outsourcing market over the past few years. The ITO and BPO industries have converged. We’ve seen the disaggregation of the market as organisations move to multi-sourced models. The growth of new entrants to the provider landscape has been explosive across specialist providers, fintechs and startups. The same technology revolution that has affected every other industry has driven major changes in supply and demand of the FS outsourcing market. On the demand side, FS institutions are increasingly looking for new solutions from outsourcers across digital development, big data and advanced analytics, regulatory compliance and cybersecurity. At the same time, the supply of services is changing with the rise of new technologies – in particular cloud, RPA and increasingly AI and blockchain. Figure 1: Supply & demand drivers changing the financial services outsourcing market. In this section of the report, we will examine each of these demand and supply side drivers individually to provide insight into how they are changing the FS outsourcing market. As customers, we are all demanding newer, faster, more user-friendly products and services from our brands. Not dissimilar to other industries, we want seamless, 24/7 propositions via any device from our FS institutions. These expectations have been fuelled by the rise of the smartphone and the corresponding new digital propositions that have emerged from fintechs. To meet these expectations, spending on digital capabilities by FS companies is rocketing. US banks are expected to increase their digital transformation spending by 23% annually to 2020. FS institutions are increasingly looking to outsourcers to support them in this transformation by providing specialised digital development services and education in approaches like Agile and DevOps. US banks are expected to increase digital transformation spending by 23% annually to 2020. NS&I, the UK Government-owned investments organisation, outsourced their entire end-to-end banking operation to Atos in 1999 (the original contract was with Siemens Business Services who Atos acquired in 2011). In 2013, the contract was renewed with an increased focus on driving digital transformation. All aspects of digital front-end development were outsourced to Atos. The key driver of this new focus was the need for NS&I to transform its proposition, so it could better engage customers in the digital age. Atos set up and ran a new Customer Experience Lab for NS&I that focussed on new digital development and used Agile development techniques. Atos also ran an education programme for all NS&I staff (up to executive level), to train them in digital transformation, changing customer expectations and Agile techniques. As a result NS&I now has over 250,000 customers subscribed to its new Premium Bond mobile app and has shifted 92% of sales to digital channels, winning Best Customer Service in Banking and Finance at the 2016 Customer Service Awards. As well as the traditional outsourcers, many new and smaller providers are emerging to take advantage of this growth in demand for digital development services from FS institutions. A good example is Gigster, backed by pre-eminent venture capital firm Andreessen Horowitz. Gigster offer software development services to large corporations through a network of freelancers (mainly former employees of Apple and Google). Their client list is strategically spread across many industries, including Mastercard, US Bank and Prudential. Other companies have emerged entirely dedicated to a single industry, providing deeply specialised digital development. A good example is London-based Kasko, who specialises in providing digital development services for large insurers – Allianz is one of their customers. Kasko offers a service enabling companies to launch new digital insurance propositions to market within a couple of weeks by outsourcing all the development to them. Big data and advanced analytics are now central to any business, especially financial services. For companies who provide individual and personalised products, remaining compliant and defending against cybersecurity attacks is what their customers now expect. We’ve seen explosive growth in the big data market – from $8bn in 2011, to $35bn in 2017 and it is expected to increase to $64bn by 2021. As FS institutions look for increasingly technical and specialised services to help them with big data and advanced analytics, many new startups have emerged in response. These startups are offering specialist services at very specific (but covering every different) point in the value chain – from data visualisation to big data exploration, aggregation and management. Quid helps companies understand large pools of unstructured data using innovative pattern recognition, data visualisation and machine learning techniques. Companies can use Quid’s tool to analyse the market, as the platform pulls in thousands of data sources, alongside your own company data. Thoughtspot enables non-technical staff to analyse large data pools through it’s platform. Staff can access customised data analytics without prior training as the platform uses natural language processing to enable users to search data using ‘everyday language’ – just like using google. Incorta offers real-time big data analytics without the big data warehouses. It reduces the 4-10 weeks development time of secure, real-time analytics applications to days, and reduces query time to seconds even when analysing data at a massive scale. We’ve seen explosive growth in the big data market – from $8bn in 2011 to $35bn in 2017 and expected to increase to $64bn by 2021. Cybersecurity has burgeoned into an industry in its own right as digital platforms, channels and the virtualisation of computing power and data storage have opened up ever-increasing vulnerabilities and points of entry for hackers. (You can read more on the growth of this industry in our white paper focussing on the growth of this industry). There has been a 165% increase in the number of publicly-reported major cyberattacks on FS institutions since 2013 and regulation is adding to the cybersecurity pressure. In Europe and beyond, GDPR legislation means companies must now report cybersecurity breaches to customers within 72 hours of an event happening. They are also now liable not just for their own breaches, but also for the breaches of any outsourcers they may employ. Under GDPR, much harsher fines will be imposed if a breach happens. It has been predicted that European FS companies could face over £4 billion in fines in the next 3 years as a consequence of data breaches. And the pressure isn’t just coming from the regulators. As customers, we are putting pressure on our banks to ensure our data is kept at the highest levels of security. It doesn’t matter to us whether our data is managed by them or an outsourcer, we just want to know it’s in safe hands. Backlash over security breaches has been fierce from customers and regulators, and the reputational damage is colossal. Notable recent events around Facebook and Cambridge Analytica are only increasing public sensitivity to the impact of data breaches. This explosion of cybersecurity risk and regulation combined with public and regulatory pressure has presented a golden opportunity for outsourcers. FS institutions are fighting over themselves to meet their customers’ expectations and are looking for new suppliers that can quickly provide them with expertise, consulting and integrated, managed security solutions. In a recent survey, over half of FS firms stated that they already outsourced company specific security activities. Over 30% say they outsource the development of their information security management systems. A proliferation of new solutions and providers has emerged to keep pace with this explosion of demand. For example, Panaseer enables companies to automate their data processes and visualisation to measure and improve cyber hygiene. In a recent Elixirr Talks podcast, Panaseer’s CISO James Doggett, highlighted that despite a widespread increase in security threats, the majority of them can be tackled. It’s all about getting the basics of security right – from controlling data that is shared with third parties to educating staff on avoiding phishing emails. A 165% increase in the number of publicly reported major cyberattacks on FS since 2013. While this context provides huge opportunity for the industry, FS institutions are also demanding greater oversight regarding their security arrangements from outsourcers. This is only set to increase as new regulation imposes harsher fines on banks for breaches by their outsourcers. Data breaches of third party outsourcers represent a big problem for FS companies. Trustwave’s 2018 Global Security Report found that third parties, including outsourcers, on average took 83 days from a breach happening to actually detect it in 2017. 83 days! Almost 3 months… This is up from 65 days in 2016 and compared to 0 days if a breach was detected internally. In response, banks are tightening contractual terms and demanding greater levels of service and higher SLAs from outsourcers to protect themselves and defend against breaches. FS institutions have now firmly escalated cybersecurity to board-level importance. From putting in place the right contractual SLAs to leveraging new solutions and technologies to manage their security risk, organisations know they need to understand how to use outsourcers better. It’s not just in cybersecurity that new regulations have driven change. Since the financial crisis, new regulation has transformed the industry. Many FS organisations are still trying to contend with the multiple waves of regulation that have come into force since 2007. Complying with the likes of Basel III, Solvency II, EMIR, Dodd-Frank and MiFID II has absorbed huge volumes of company resource, and the cost of remaining compliant has become almost unsustainable for smaller organisations. For all FS institutions (especially the smaller ones), leveraging the economies of scale and specialised services offered by third party regulatory reporting and advisory services has become the only way they can sustainably achieve compliance under new regulatory regimes. This presents a huge opportunity for companies to develop new products and services that provide FS institutions with easier, more cost effective and efficient ways of attaining compliance. These new solutions have been developed by lots of different types of providers, both old and new players, from the traditional outsourcers and FS institutions, to new utilities formed by groups of FS companies and regtech startups. For example, Bloomberg recently launched RHUB, a regulatory reporting solution that allows firms to outsource their transaction and trade reporting requirements that form part of MiFID II. One of these new regtech providers is RegAssur, who are using AI and big data analytics to provide ongoing reassurance to FS institutions that their governance, risk and compliance environments are functioning as they should be, in line with key regulations. It does this by modelling the effect and impact of relevant regulation on a firm’s internal processes and controls. The cost of remaining compliant has become almost unsustainable for smaller organisations. Cloud computing, both public and private, is a huge growth area for the outsourcing industry. Continuing concerns over security and data ownership with the usage of cloud services have started to be addressed (or at least understood) by FS institutions. They have increased their adoption of the cloud and become increasingly more mature in how they use it. Reflecting this, the application of public cloud services in FS has moved beyond experimentation and developed into scaled business solutions. For example, the 2017 deal between UK bank Lloyds and IBM to provide cloud outsourcing services is worth £1.3bn. Companies that were barely on the radar when Elixirr first published this report in 2010, like Microsoft Azure and Amazon Web Services (AWS), are now household industry names. Gartner predicts that by 2019, 90% of native cloud IaaS providers will be replaced by the duopoly of AWS and Azure. As use of cloud continues to grow and FS institutions become more mature in their understanding of it, cloud service providers will need to specialise to avoid a ’race to the bottom’ of basic commodity cloud hosting. We expect the next major step for the cloud industry to be the growth of effective brokerage platforms, whether as software or fully managed services. This will really make hybrid public / private cloud integration totally seamless, likely spelling the beginning of the end for the corporate data centre. The role of cloud brokerage extends across the entire value chain, from the day-to-day management and use of cloud, to dynamic bursting, to optimising deployment to ensure that all possible cost-saving and agility benefits are achieved. By 2020, it is expected that 90% of companies will adopt hybrid cloud infrastructure management capabilities. This has the potential for significant cost savings. A study for Reuters estimated savings in the region of 25% by 2019 on technology infrastructure costs for the biggest global banks when they deployed cloud solutions. Based on experience, we believe in this sector this saving could be even higher for fully integrated, hybrid public-private cloud deployments. As well as creating an entirely new area of outsourcing, cloud has also driven the convergence of the ITO and BPO industries. Cloud has been a key enabler in the saturation of technology into all areas of business process – making technological solutions a key part of any BPO proposition. BPO providers now look to offer full-stack solutions that include not only the resources, but also the technologies needed to underpin business process capabilities. New technologies, mostly delivered through the cloud, have also begun to replace human resources with tech in even the most traditional BPO space, including the rise of chatbots in the contact centre industry and automated fulfilment solutions in IT support. Software houses have also developed cloud-based SaaS versions of a broad range of offerings encroaching on the areas previously dominated by the major ITO providers, removing the need for separate infrastructure provision and application maintenance. We expect the next major step for the cloud industry to be the growth of effective brokerage platforms, the beginning of the end for the corporate data centre. Cloud has also been a key enabler in the growth of the ‘plug and play’ model in outsourcing. Working with multiple smaller providers is now much easier for FS institutions as services can be delivered through the cloud. At the same time, cloud has enabled companies to work with smaller outsourcing providers because access to outsourced cloud infrastructure has enabled the emergence of new startups who are offering services to FS institutions. The less capital-intensive access to computing power, such as that provided by AWS, has enabled the fintech boom. Most fintechs, for example Aire (credit checks) and Stripe (payment processor), have built their infrastructure entirely using cloud solutions. More recently, the adoption of solutions driven by machine learning, like robotic process automation (RPA), is powering the transformation of a whole host of services. RPA is being used to automate the remaining human tasks in business processes, further blurring the lines between ITO and BPO, enabling higher service levels for clients. BPO giant Genpact has estimated that RPA can boost the productivity of a process by 10-50%. Services can also be delivered at a significantly lower cost because of reduced human labour requirements. This is shrinking outsourcing contract values as buyers expect their service providers to pass on the cost savings. The growth of RPA is also enabling the emergence of a new group of ITO providers who are competing with traditional BPO outsourcers. These new providers are enabling FS institutions to implement RPA themselves to automate processes. This means FS institutions are able to drive the efficiencies and cost savings they would have previously looked to BPO providers to provide them with themselves, and at a much cheaper cost. An example of one these new providers is UIPath who offer an enterprise RPA platform. Sumitomo Mitsui Banking Corporation, one of Japan’s leading banks, used UIPath technology in 2017 to implement RPA for compliance and risk operations, branch operations, routine operation centre processes and other high-volume routine activities. 250 operations were automated and it is estimated 3 million hours will be saved by 2019 (650,000 hours have been saved so far). In the medium term, the project is expected to save the bank a not insignificant $1 bn. The combination of new RPA ITO providers and RPA being implemented by BPO providers themselves, will likely result in significant human capital challenges for the outsourcing community. Employees will have to be moved to more complex roles which require value-adding judgement or front-line customer contact. However, there will naturally be a limit to the level of possible redeployment. It is an inescapable reality that this will drive a reduction in the size of the workforce required by the FS outsourcing industry. AI and blockchain are transforming the capabilities of the whole FS industry, not just outsourcing. For the large part, their impact on outsourcers is still far from fully realised, but most outsourcers have started experimenting with the technologies. The application of AI is more mature than blockchain. Traditional providers such as Genpact and IBM have developed new client propositions through their explorations of AI technology. The IBM Watson Assistant, now an important part of IBM’s offering to its outsourcing clients, uses AI to offer a natural language search and chatbot service for voice and text channels. RPA can boost the productivity of a process by 10%-50%. UBank in Australia implemented IBM’s Watson in 2017 to offer an assistant to their customer service team. The assistance allows staff to search the bank’s databases using natural language and answers are presented in seconds. Within a month of implementation, it sped up processes by more than 40% for UBank’s employees. Response times for customers increased significantly as the search time of customer service staff dropped by 33%. The huge potential of AI across the whole FS value chain, and its complexity, has meant that institutions are looking to new specialist startups to provide them with services. We’ve seen large growth in the number of third parties that FS companies are working with, as many companies are now purchasing services previously managed in-house. Emerging AI startups are providing services to institutions across all areas. From credit scoring (e.g. 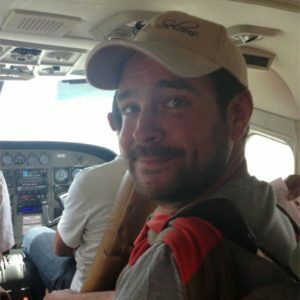 Aire, Zest Finance), to bots and assistants (e.g. Penny, Conversable), fraud detection (e.g. Feedzai, BioCatch) and quantitative trading (e.g. Alpaca, Sentient). Although to date, there are very few tangible, at-scale implementations of blockchain or Distributed Ledger Technology (DLT) in FS outsourcing, there is huge investment across the industry to look at its potential uses. Blockchain PoCs and pilots are popping up across practically every area of FS operations as companies new and old race to be the first to realise the massive potential of DLT. Perhaps some of the solutions closest to gaining traction are in investment and asset management. In particular, there are several new blockchain solutions in the Transfer Agency arena. Consortium-led market infrastructure solutions like FundsDLT (built by Luxembourg Stock Exchange-owned Fundsquare) and IZNES (built by SETL) are due to take their solutions from pilots to live market solutions in France and Luxembourg this year and next. Several major asset managers already on board. The industry will be keenly watching to see how much of the promise of blockchain solutions is realised. The emergence and proliferation of new technologies is clearly providing opportunities for organisations and outsourcers, but it also means that FS organisations are having to change the way they traditionally engage with their providers. To manage a multi-provider environment and work with smaller (and often less mature) companies, FS organisations are adopting new ways of working and much more flexible commercial models. A very different and much more collaborative approach is required for working with smaller organisations. For example, co-creating solutions rather than following strict RFP processes, reducing procurement and legal red tape to bring innovative solutions to market faster. We expect these technological shifts to create an outsourcing landscape that looks and behaves radically differently in the years to come. Institutions are looking to new specialist startups to provide them with services. 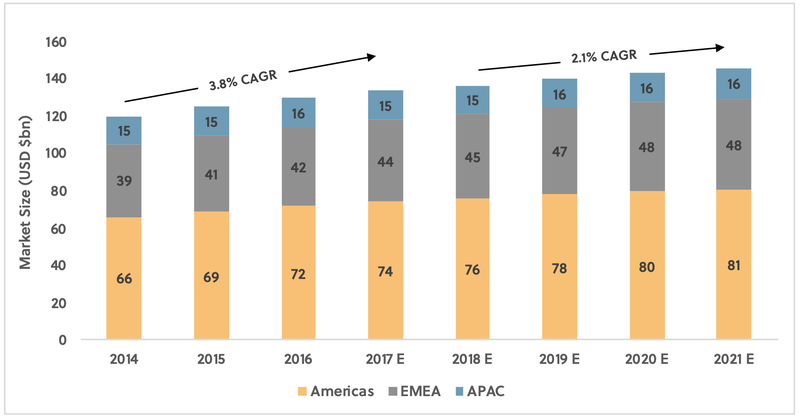 Now that we’ve examined the overall shifts in FS outsourcing, the next section will dive into each trend by geographic region, service domain and by FS industry sector. In this section, we will look at each region and examine the key trends in ITO and BPO and how they reflect or differ from the macro trends. As depicted by figures 2 and 3, unsurprisingly the Americas continue to be the largest market for ITO and BPO. This region accounts for over 50% of the total market value, and its dominance is expected to continue. The prominence of the Americas in both the ITO and BPO markets is not only a product not only of the number of individual outsourcing deals in the USA, but also of the highest average transaction value per deal of any region. Although outsourcing ‘mega deals’ ($500m+ transactions) are becoming less common across all regions, the scale of some of the larger US companies means they are still taking place. Tata signed the largest deal in its history with Transamerica, a major US insurer, at the beginning of 2018. It was a joint ITO and BPO outsourcing deal worth $2 bn over the lifetime of the contract. While the market for both ITO and BPO in the Americas is still predicted to grow, it is likely to slow significantly over the next few years. 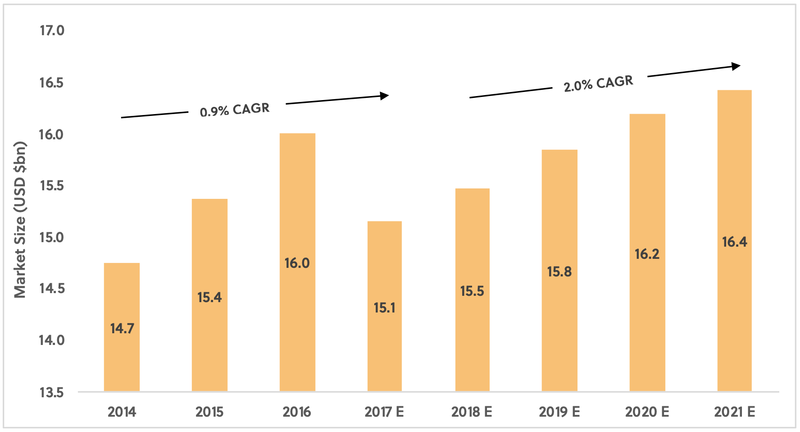 For ITO, the expectation is from 4.0% CAGR between 2014-2017, to 2.0% CAGR 2018–2021. 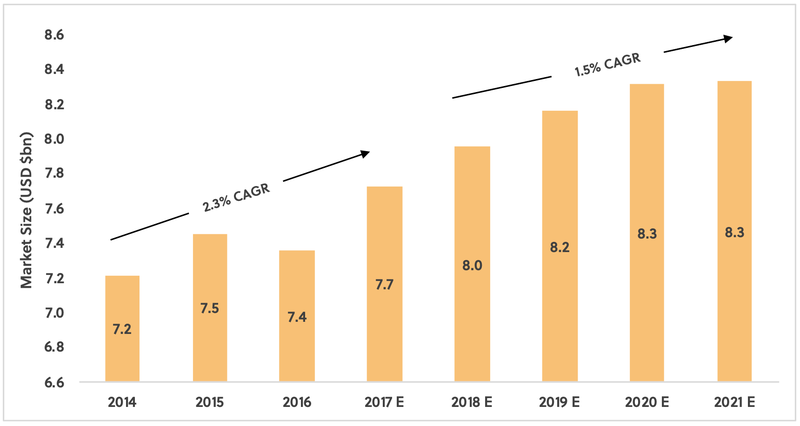 For BPO, from 8.1% CAGR 2014-2017 to 7.5% CAGR in 2018-2021. Particular trends in the ITO and BPO markets are partly driving this slowdown, but in the USA it can also be attributed in part to the shift in American politics since the election of Trump in 2017. The current administration is pursuing a policy agenda that favours domestic services over foreign trade and immigration through changes to trade agreements, regulations, tax policies, and visa and immigration directives. New tariffs have been imposed on China, Canada and Europe. Given the outsourcing industry’s dependence on lower-cost offshore resource, the impact of this shift could be seen even before the tariffs were imposed. Outsourcing firms are now struggling to exchange their resources in and out of the US. The Indian outsourcing trade association, Nasscom, lowered the industry’s growth projections for 2016-17 to 8-10% (from its earlier projections of 10-12%), following Trump’s inauguration. Some larger US contracts have not been renewed as expected, and existing contracts have been shortened significantly. US companies are adding clauses to contracts for exit policies and entering into price re-negotiations. Meanwhile, India-based companies are adding clauses around deliverables and timing that protect them against the risk of tariffs to service-based trade being introduced in the US. Starting to affect the ITO market in the USA is the tightening of the US visa programme for foreign professionals. From 31st March 2017, not all programmer positions qualify for the H-1B visas (which allows foreign professionals to work in the US for up to six years). Currently, these visas are used heavily by India’s $150 bn IT sector by companies such as Wipro, InfoSys and Tata Consulting, so they can fly relatively inexpensive engineers to the US. The changes mean that outsourcing firms are now struggling to exchange their resources in and out of the US, and this will likely impact resourcing models and increase costs. ITO growth in the Americas has largely been driven by cloud adoption which has increased exponentially over the last few years. It is expected to continue its growth, particularly in cloud brokerage. A number of notable deals have taken place in this space in recent years. In 2014, IBM signed a six year technology services deal for $500m with The Hartford Financial Services Group which included a move to a private cloud-based infrastructure. As the United States’ 13th largest property and casualty insurer, the Hartford hopes that this investment will allow them to act with greater agility, flexibility, transparency and competitiveness. Recently JP Morgan Chase, Liberty Mutual and Capital One have all significantly increased their cloud adoption. 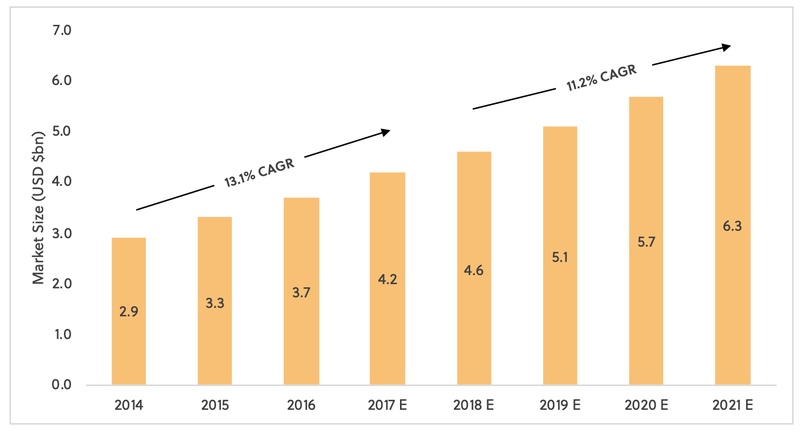 This trend continues to be borne out by recent outsourcing activity, including cloud-based software services as well as infrastructure and platform hosting, such as the recent deal between Oracle and Bank of America, and the continued growth of cloud providers. AWS’ annual earnings more than doubled between 2015 and 2017. The scale and complexity of potential cloud migration and hybridisation across North America’s FS landscape means that the pipeline of opportunity is unlikely to be exhausted in the short or medium term. Although the BPO market remains comparatively small when compared to ITO, the Americas is also the largest market globally. The total value of BPO market is less than 31% of the ITO market on average, in the Americas and worldwide. Nevertheless, the market has grown rapidly. From 2014-2017 in the Americas, BPO grew at 8.9% CAGR and even though it has now matured, growth is still predicted to continue at over 7.3% CAGR a year going forward. Nasscom lowered India’s outsourcing growth projections for 2016-2017 to 8-10%. This growth will largely be driven by demand for, and supply of, the specialised services we looked at in the first part of this report: digital development, cybersecurity, regulation, RPA, AI and blockchain. Demand for digital development, cybersecurity and regulation services are all increasing and are an important part of some of the largest new deals. For example, included in the deal between Transamerica and Tata mentioned earlier was the outsourcing of some digital services to drive a major enhancement of Transamerica’s digital capabilities. On the supply side, new developments in RPA, AI and blockchain will drive new business by fundamentally changing the services outsourcers can provide. Although the efficiencies they are driving will make services cheaper, they may also slow down the growth rate of BPO in the Americas due to a reduction in deal sizes. Like the Americas, EMEA has remained a buoyant market for FS outsourcing over the last 4 years. EMEA is the second largest market for FS outsourcing across ITO and BPO. Regulation has been one of the largest areas of growth over the last few years in Europe, and it is expected to continue to grow. FS institutions in Europe are looking to specialist providers to help them comply with the huge levels of new regulation they are facing. Regulation is placing a whole host of new demands on FS institutions, from GDPR data regulation to MiFID II investment banking regulation, as well as the drive towards open banking through the EU’s Payment Services Directive (PSD2). As mentioned earlier in this report, this has driven the emergence of a plethora of new providers who can provide compliance support to FS institutions – from brand new startups through to established players (e.g. Bloomberg) launching new services. Particular regions in Europe are witnessing stronger growth than others. Eastern Europe as an outsourcing location is enjoying continued popularity. Penetration of jobs in outsourced businesses services as a percentage of the population is now higher in Poland than it is in India. Demand is only set to increase further as FS institutions are increasingly seeking highly skilled pools of workers to perform more complex tasks, particularly across back-office business processes, and software and digital development. Eastern European countries have invested heavily in education over the last decade, and they now boast a strong software development workforce at a much cheaper price. According to Daxx, offshore development rates in Eastern Europe are between $25 and $40 per hour; while in the United States a software developer of similar experience can cost above $100 per hour. In addition, the Eastern European market is also very attractive for outsourcing these more complex services as it operates in similar time zones, so it is much easier to work together and collaborate. This is particularly important in software and digital development work which uses DevOps (Development and Operations) and Agile ways of working. For example, Swiss-domiciled firm Luxoft specialises in this model, and has seen a significant uplift in demand for services. UBS and Deutsche Bank are among the clients it supports from Eastern European locations. Also driving growth in the Eastern European market are changing consumer expectations and social pressure to shift offshore activity back to the local country or a closer neighbour. This is driving a shift from offshore call centres and customer-facing operations back to Europe. Across Western Europe, the Customer Contact Centre Outsourcing (CCO) market in FS has shown a notable increase in onshoring activity, as buyers have increasingly focused on service quality and demonstrated a preference for agents located close to their customers. In some markets, this has even been legislated for. In 2016, the Italian government introduced new legislation that means customers must have the option of speaking to someone in Italy when they call customer service. This public pressure and legislation in some markets has led many companies (including EE and Vodafone in the UK ) to bring their call centre staff back onshore across Europe. In many cases, companies are bringing back services that were outsourced in other markets and managing the new onshore call centres internally. Sweden has had the highest global fintech investment per capital over the past five years. Of particular note is the growth of the outsourcing market in the Nordic regions. The number of deals reported here accelerated considerably when comparing the 2008-2012 period with 2013-2017. During this later period the Nordics represented on average 20% of the total number of outsourcing deals made across EMEA, whereas previously they only represented 6%. Further contributing to the Nordic’s strength as an outsourcing hub in Europe is its importance as a fintech hub. Sweden has had the highest global fintech investment per capita over the past five years. Startups based in the Nordics such as BehaviorSec (biometric security for banks) and Snow Software (optimisation of cloud spending and software licensing), are offering specialised outsourcing services to FS institutions across the world. This explosion of new Nordic fintechs and the continued strength of traditional Nordic outsourcers, such as Tieto and EVRY, drive our conclusion that the region’s importance as a hub for outsourcing will continue to increase – not only within Europe, but globally. The rate of growth in APAC ITO is much slower than when compared to other markets over the last few years. However, it is expected to buck the trend in the next 3-4 years which would make it the only region to experience an increased rate of growth in ITO compared to 2014-2017. Similar to EMEA, APAC is expected to see the BPO growth rate increase between 2018-2021 when compared to 2014-2017. The BPO market size increased by 9.6% CAGR 2014-2017. But is forecast to grow to a CAGR of 10.6% 2018-2021. While this rate of growth for BPO is the fastest in the world, it will remain the smallest BPO market. This expected rapid growth in BPO is being driven by strong economic growth in the region, and the increasing maturity of key markets and companies. Asia in particular is one of the highest growth regions in the world and is expected to buoy world growth over the next few years. Asia’s GDP is expected to grow by about 6.5% from 2018 to 2019 – accounting for about half of worldwide economic growth. This strong growth means companies are looking to expand and have resources to spend on outsourced services. However, Asian markets have experienced even stronger growth in the past, but the difference this time is the greater maturity of their markets and the companies that operate within them. Asian companies are looking to expand and have resources to spend on outsourced services. As companies in these markets become larger and mature, they are looking to standardise and increase productivity in corporate support functions. Asian companies now account for about 40% of the global Fortune 500 companies. In 2001 it was 20%. These major companies are looking to gain access to global best practice and efficiencies through outsourcing key services. At the same time as Asian companies have matured, the markets they operate in have also started to experience significant wage growth. For example, wages were expected to grow by 10%, 9% and 7% in India, Philippines and China respectively. This can be compared to expected growth of 2.9% and 3% for the UK and USA respectively. In response, companies have looked to outsourcers to provide them with the same services at lower costs by using their deep expertise and economies of scale. The ITO growth seen in APAC has largely been due to strong demand for digital and next generation banking services over the last few years. For example, one of the largest recent ITO outsourcing deals in APAC is between ANZ and IBM, focussing on cloud services that will enable ANZ to service a growing number of customers across all of its channels. It also included a new innovation lab powered by IBM’s Bluemix Platform-as-a-Service (PaaS) offering that lets developers build, test and deploy new applications faster and more cheaply. We have looked at the areas impacting ITO as a whole – cybersecurity, cloud services, RPA and AI. In this section, we now focus on the specific trends within ITO’s various service domains. We’ve seen that global ITO market growth looks set to slow in coming years. This is due to the greater level of outsourcing maturity already found within this area, increasing adoption of new development methodologies and increasing capital restrictions found within several major outsourcing industries, such as retail and commercial banking, and wealth and asset management. In addition to these drivers, some businesses are recognising a need for closer integration of IT with their businesses and this is leading to a degree of insourcing in some financial institutions. From 2012-2017, Global In-house Centres (GICs) in India have seen a 12.4% CAGR in revenues when compared to 9.3% revenue growth in India’s top 4 ITOs. ITO companies have had to rethink their approach to contracting as movement away from the mega deal approach continues. The rise in popularity of new development methodologies, such as DevOps and Agile, are driving leaders to look for more responsive providers. Tata Consulting Services announced at the end of last year their intentions to move away from long-term revenue model forecasting in order to allow them to adopt more short-term, quicker delivery models. However, the industry recognises the potential impact this is likely to have on profits due to the added complications it will drive in investment planning. The migration to cloud is driving the convergence of ITO and BPO as BPO providers can more easily offer technology through the cloud to supplement their traditional offering. It also allows companies to take a ‘plug and play’ attitude to outsourcing – accessing the services of many specialised providers through the cloud. This convergence can be seen in the data as a movement of revenues from ITO to BPO, and slowing ITO growth across industries. Global in-house centres (GICs) in India have seen a 12.4% CAGR in revenues when compared to 9.3% revenue growth in India’s top 4 ITOs. Infrastructure outsourcing in FS continues to grow, albeit at a slower rate, as firms look to drive down operational costs while simultaneously leveraging industry best practice. Most of the continued increases in demand is focussed on the provision of cloud and cybersecurity solutions. The growth of cloud-based solutions has exploded recently. It is estimated that the global public cloud market will be worth about $186bn in 2018, up from $129bn in 2016. FS firms have long been cautious with cloud adoption, but this attitude has changed over the last five years. The sector is becoming more comfortable with the involvement of cloud within IT infrastructure, having been attracted by the lower up-front cost savings. Several large institutions (e.g. JP Morgan) have even proclaimed that they will move much of their infrastructure to the cloud in the near future. In 2017, they completed the migration of several trading and risk applications across to the public cloud. It’s safe to say that JP Morgan are not alone, as many more institutions are exploring the benefits associated with cloud. Though for many private companies, cloud forms a greater part of their strategy than publicly-hosted platforms – for now. The flexibility offered by cloud computing over traditional outsourcing agreements has truly disrupted how firms provision and use IT infrastructure. The increasing popularity of the cloud is evidenced in the deal between IBM and Lloyds Banking Group. In 2017, they signed a 10 year contract worth £1.3 billion for cloud services. This deal will see IBM provide dedicated private and public cloud offerings hosted securely in Lloyds’ and IBM’s UK data centres, and will assist with application migration to the cloud. The move towards cloud-based solutions brings with it increased vulnerabilities. Combined with regulatory pressures (especially in Europe), cybersecurity is now at the forefront of FS organisations’ concerns. As a result, cybersecurity is becoming an even bigger part of infrastructure outsourcing deals. In fact, an increasing number of deals focus only on cybersecurity – a sign of its growing importance. In a recent example, IBM has signed a five year contract with the Bombay Stock Exchange (BSE) for IBM Security to design, build and manage a Cybersecurity Operations Centre (CSOC) to safeguard the company’s assets and protect stakeholder data. IBM will work with BSE to integrate security solutions that will add new capabilities to the SOC infrastructure, as well as develop a new, highly collaborative IBM and BSE framework for the multi-tenant, next generation SOC. The centre will enable security event monitoring, event handling, security analysis, incident management and response along with synchronized management of devices, networks and applications. The growth of demand for cybersecurity specialist services is driving an explosion in new startups. This can be seen in the huge increase in funding invested in cybersecurity startups over the last few years – from about $1.9bn in 2013 to $7.6bn in 2017. Comparing the number of application development and management deals from pre to post 2013 shows a dramatic rise, but growth has since flattened in the years to 2017. This has been driven by large scale vendor rationalisation and portfolio consolidation activities. As industries like wealth and asset management, capital markets and investment banking move towards adopting ‘off the shelf’ products, there has been a reduction in demand for custom application development. The maturity of more commoditised products has lowered the need for highly bespoke solutions. This has been further exacerbated by a shift in client engagements from traditional application services outsourcing towards consulting-led engagements for digital transformation. Commercial off the shelf (COTS) software remains a key part of most FS institutions’ technology stack, especially where the advantages of extensive customisation often erode. Customisation adds cost and makes change harder, adding complexity and risk for the buyer and the provider. FS businesses commonly perceive established software houses to be a safe pair of hands in operating their mission critical systems because they have proven their performance and resilience, so COTS software remains ‘sticky’ in enterprise systems. As these products become more commoditised, this will place downward pressure on pricing and market revenue growth. 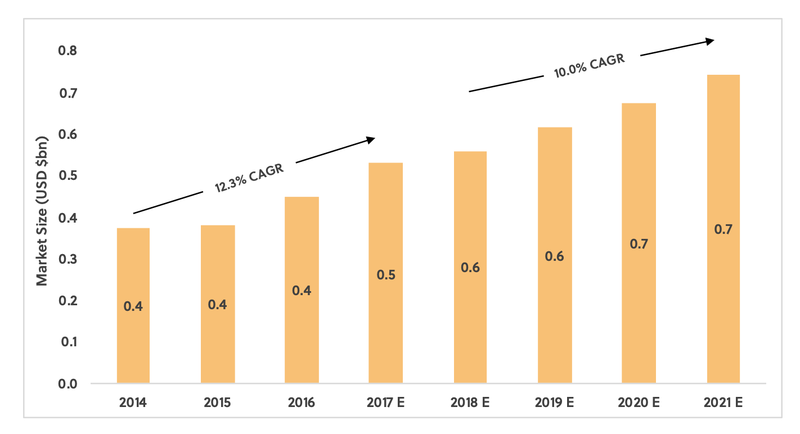 Combine this trend with a move to more SaaS models for many COTS software packages, reduce the need for significant maintenance and development resource (whether in-house or outsourced), and the reasons for flattening growth become more apparent. There is also a trend for FS companies to see some core applications as a differentiator for their business, so they will look to bring the support in-house, rather than outsource. For example, in 2017 DBS Bank launched the largest banking application programming interface platform in the world. To achieve this, they increased their insourced technology team by more than 1,300% in 2016-2017. Taking this a step further, Blackrock’s Aladdin platform has become one of the most commonly used portfolio management platforms in the asset management industry, having started life as a Blackrock in-house application. Industries like wealth and asset management, capital markets and investment banking are moving towards adopting ‘off the shelf’ products. The move to Agile digital development has prompted a necessary convergence in the development and maintenance of applications. There has been a giant leap from the historical segregation of the two, towards a DevOps mentality. It is now common practice to reside the development and maintenance of a company’s applications with one single provider, allowing for a more agile and efficient process. One example is the 10 year renewal and expansion of CGI’s long-term partnership with iA Financial Group (Industrial Alliance Insurance and Financial Services Inc.). Valued at approximately $150 million, the agreement sees CGI continuing to support the strategic growth of one of the largest life and health insurance companies in Canada. It remains iA’s preferred IT partner and provides a wide range of IT services and solutions to support its digital transformation, including application development and maintenance. The growth of consulting services within ITO outsourcing is in direct correlation to the move away from large scale integration and support of legacy or heavily customised technologies to new ways of working such as DevOps and Agile, often focussed around digital solutions, as these kinds of application development activities require shorter timescales and more flexible workforces to deliver. For front office services, custom-developed applications delivered by Agile and DevOps methodologies have become essential to meeting customer needs. FS institutions are beginning to understand that threats to their businesses are no longer coming from traditional competitors, rather from nimble startups who can claim open source and custom development as a core competence. In a recent survey, Accenture found 99% of payments executives at major banks indicated that their firm will have made investments in open source software by 2020. 63% believe it is open source custom development that will stave off the threat from their startup competition, and that this skill is already an important part of any IT consulting service. The growth in DevOps and Agile training required to make this happen is both being provided by, and driving growth in consulting services. COTS solutions remain a key part of most FS institutions’ technology stacks. This has driven continued growth of consulting services oriented around integration, configuration, upgrading and re-platforming of these systems. While open source custom development is likely to become a more prevalent architectural paradigm for in-house projects, outsourced COTS solutions are unlikely to go into dramatic decline, driving a continual requirement from consulting services to bridge the gap between the two models. Threats to FS institutions are no longer coming from traditional competitors, rather from nimble startups. Recent years have seen disruption in the FS BPO market driven by technical developments such as RPA, analytics, and AI. These technology advances have provided new revenue opportunities through automation, improved fraud identification and risk modelling, and the provision of next-generation services through chatbots and virtual assistants. On the other hand, this has also reduced human labour requirements and shrunk contract values as buyers expect service providers to pass on the cost savings. We expect to see substantial activity in this area over the next few years, particularly in industry-specific process solutions (vertical BPO). As FS firms continue to leverage outsourcers to drive operational transformation, support new products and improve their regulatory compliance and reporting, vertical BPO will continue to rise. The modern, tech-savvy and engaged customer of today demands to be informed faster and more regularly than ever before. This, and our use of increasingly diverse channels has created a powerful space for differentiation by improving customer experience. What were once back-office processes have never been seen as the answer to capitalising on customer experience opportunities. However, the increase in customer demand directly links operational efficiency and productivity to customer satisfaction. In 2016, Atos signed a 13 year deal with Aegon to manage all aspects of the insurer’s business processes across the UK and Ireland, ranging from underwriting to claims management for customers. This sort of behaviour would align to the increase in customer demand seen for pension transfers observed since the introduction of pension freedoms in 2015. As demonstrated in Figure 9, horizontal BPO is primarily driven by CCO, HRO, and other functions such as analytics and document management. Together, these represent 70.0% of the entire BPO market for FS. Recently, some large outsourcers have exited the market or spun off their CCO functions into distinct new businesses. A good example is Xerox. 2017 saw them spin off their customer service arm to form Conduent, a now entirely separate BPO business. This is reminiscent of IBM’s 2013 strategy, driven by lowering margins, that saw them sell their customer care services business to Synnex. Despite this behaviour by some, the FS CCO industry is poised to grow steadily, and 4-5% CAGR is forecast 2017-2021. More and more businesses are now looking beyond CCO as simply a cost saving opportunity and are realising how they can deliver new sources of value. With the expected rise in demand for remote working and the increasing complexity of omnichannel and customer data analytics, buyers are looking to leverage outsourcers to provide an improved, more reliable customer experience. The blurring lines between ITO and BPO are especially noticeable in the CCO space, as many traditional BPO providers now offer software solutions that enable their customers to take advantage of some of the technological developments happening inside their own call centres. Genpact’s Neural Chat Assistant sits alongside its traditional contact centre offering. It uses AI and machine learning to respond to customer messages via chatbot or voice requests and then efficiently pass them to the right agent. Genpact claims it increases agent productivity by 100%, and reduces call times by 50%. The effective application and experience of new technologies to supplement customer contact capabilities does position outsourcers to take advantage of near-term growth in this area. Nevertheless, this model will eventually require less human capital and ultimately put further pressure on margins as the technologies mature and commoditise. 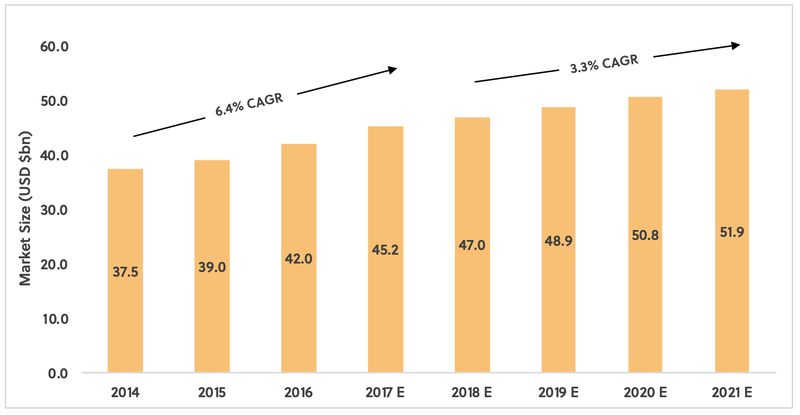 Increased offshoring in payroll, demand for analytics, automation, better user interfaces and a preference for single-platform, multi-lingual and multi-country processing has triggered demand for payroll, recruitment processing, and benefits services within HRO – all leading to the growth in this domain. Outsourcing providers are offering broader end-to-end solutions that incorporate the newest technologies, such as cloud ERP solutions. One example is DNB ASA of Norway choosing Zalaris ASA in 2017 to deliver a wide range of cloud-based HR services to their global workforce of 9,500, as well as a cloud-based payroll service to the bank’s Norwegian staff. Buyers are looking to leverage outsourcers to provide an improved, more reliable customer experience. The global scope of the five year contract includes implementing SAP’s SuccessFactors Employee Central for employee master data management and the SuccessFactors talent suite for talent management, workforce planning and HR analytics. Many new startups are also entering this space and taking advantage of the high demand, especially as employees look for their HR services to be available to them in the same way they consume services outside of work i.e. with a slick user interface and on their mobile. Zenefits is a leader here, providing cloud-based, end-to-end HR solutions to small and medium size businesses. The FAO market clocked up 8-9% CAGR in 2015-2016, while the procurement outsourcing market enjoyed 10-15% CAGR in the same period. 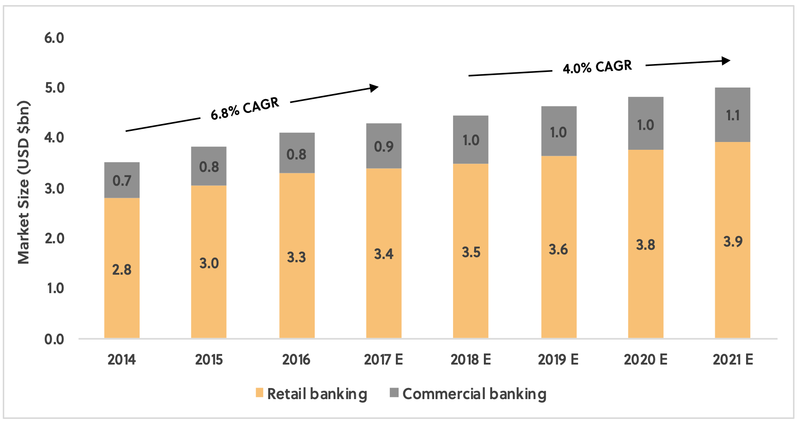 Where previously FAO was driven by basic financial transaction services and accounting processes, the substantial growth rate seen here tells of the success of expansion into non-transactional offerings, such as financial analytics. When combined with the globalisation of service offerings into non-traditional markets and the increased uptake of full stack solutions (i.e. business process and application platforms combined), this pours fuel on the growth of this domain. Such solutions provided by FAOs are now offering built-in regulatory reporting services, due to the ongoing pressure placed on the industry for compliance. In 2017 Ping An Asset Management Company (PAAMC) signed a 5 year deal with SS&C HiPortfolio to provide back office functionality, such as investment accounting, but also to support with ensuring regulatory compliance following changes driven by IFRS 9 regarding classification and measurement of financial instruments, and the impairment of financial assets. Similarly, the growth in PO has been driven by offering expansions and perception changes of exactly what this domain has to offer. GEP, the procurement outsourcing specialist, now offers its clients full end-to-end procurement and supply chain services, including sourcing support, category management, supplier relationship management and procurement operations. In early 2017, Prudential UK & Europe signed an agreement for GEP to provide such a service which includes access to their cloud-based source-to-pay procurement software platform. There has also been a growth in procurement spend analytics offerings, with some providers offering contingency fee models based on how successful they are in reducing their clients’ spend or identifying billing errors. For example, US-based PGRX offers full source-to-pay analytics services as well as contract compliance audit and recovery for over payments. By far the largest sub-domain of services in this category is Document Management BPO. However, demand for this service is slowing down due to increasing digitisation of documents. Many companies have taken document management in-house, using software solutions. Where document management BPO providers can still remain relevant is where clients have complex regulations or other requirements which restrict them transitioning to a paperless world. The 2015 InfoTrends survey found that of the businesses falling short of their paperless adoption targets, 37% had compliance concerns that impacted their ability to achieve them. Of this group, 33% stated that were restricted by industry regulations. As the exception in this category, analytics BPO services showed a 25-30% CAGR across 2015-2016 and this strong performance is expected to stay in the range of 19-23% CAGR across 2017-2021. Analytics, MI and reporting services are all benefitting from the huge growth in big data, AI and enhanced analytics capabilities. They are increasingly being used in non-traditional areas, like compliance. This growth in analytics goes hand in hand with the rise of the big data industry. It has increased from $8bn in 2011 to $34bn in 2017 and expected to increase to $65bn in 2021. The complexity of the technology in this space, and the pace it is moving at, means that companies are looking to BPO providers to provide specialist services. Again, many new smaller providers are entering this market to fulfil this demand, offering cutting edge technology to FS institutions. One such new entrant is Hyper Anna, funded by VC firm, Sequoia Capital. They won WestPac’s 2017 Business of Tomorrow award for offering a virtual data analyst assistant for FS institutions. It uses machine learning and AI to help with everything from revenue forecasting to customer behaviour, business development, expense management, supply chain management and many others. 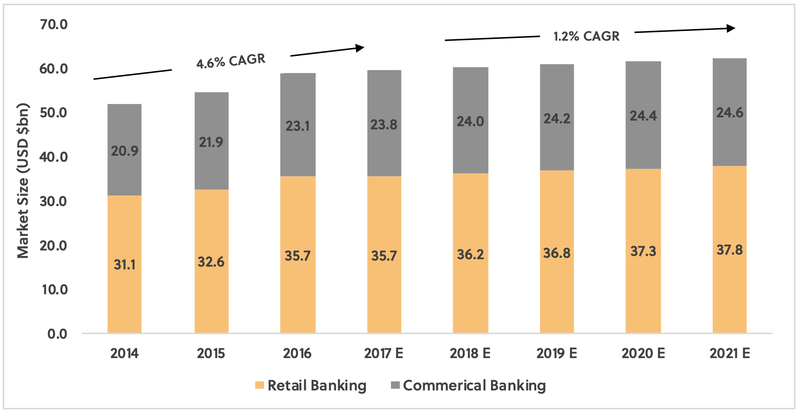 Growth in outsourcing in retail and commercial banking has been driven recently by demand for cloud and the digital transformation of IT services. One example of a bank illustrating this trend is UK financial services group, Virgin Money. While Virgin Money can very much consider itself a challenger bank (it obtained its retail banking license from the Financial Services Authority in 2010), it is itself facing fierce competition from the new digital only, app-based challenger banks. By the end of 2016, to mitigate the threat of new challenger banks like Monzo, Starling and Tandem, Virgin Money outsourced the build for a brand new digital core banking platform to 10x Future Technologies, the startup founded by former Barclays CEO, Antony Jenkins. Though it remains to be seen whether CYBG (Clydesdale Bank & Yorkshire Bank), Virgin Money’s new owners, will continue with their strategy or look to leverage their own in-house digital platform B. 2015 to 2017 saw Deutsche Bank employ an additional 4,500 engineers worldwide, focusing on application services. Despite such recent opportunities, growth in ITO and BPO markets is expected to slow in the near future. ITO growth is expected to drop from 4.6% CAGR in 2014-2017 to 1.2% across 2018-2021. BPO growth is expected to slow from 6.8% CAGR in 2014-2017 to 4.0% in 2018-2021. This is due to the increasing maturity of the market as arbitrage opportunities become fewer and further between, and technological innovation makes outsourcing services cheaper. This waning is further exacerbated by declining revenues, surging regulatory costs, spiking loan losses along with capital requirements restricting the revenue available to invest, particularly in large scale IT and process transformation. The rise of mobile and improved experiences from new challenger banks, like the UK’s Monzo, or Germany’s N26 for consumers or Finland’s Holvi for commercial banking, have completely transformed our expectations as customers. The incumbent high street banks are reassessing their capabilities. Some are turning to outsourcers (traditional and new), but many are looking at insourcing. Keeping your business close to your core IT competence is being perceived more and more as a competitive advantage. And we would agree. 2015 to 2017 saw Deutsche Bank employ an additional 4,500 engineers worldwide, focusing on application services. This aligns with the general flattening of growth seen in this outsourcing domain that we discussed earlier. Deutsche Bank are now able to develop their own ‘plug and play’ platforms and white label products to other businesses, generating entirely new revenue streams. It’s gone from a business who once outsourced approximately 80% of its technology to more of a 50:50 ratio. By keeping these important capabilities in-house, commercial and retail banks now hope to combat the increasing wave of challengers with sustainable advantage through customer focus. An advantage built on faster development times and greater quality assurance, all in a time of reduced capital availability. 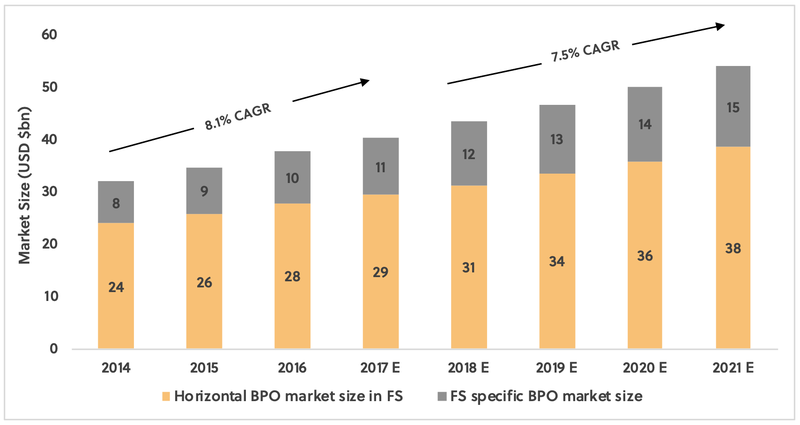 *Sector specific BPO market, excluded horizontal BPO market size. 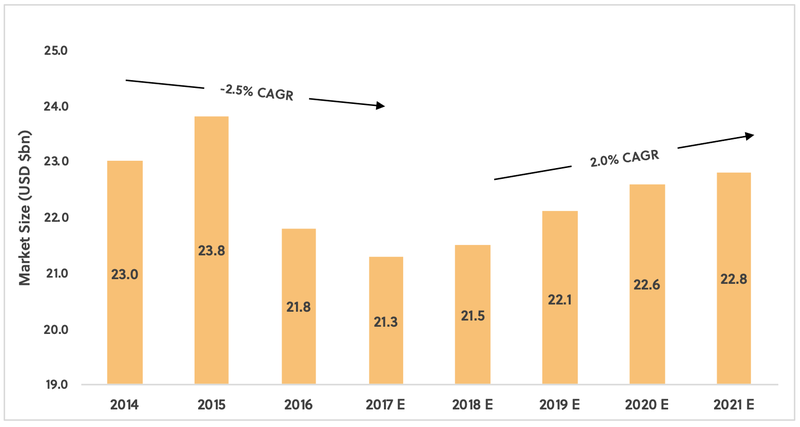 ITO services growth in wealth and asset management has remained relatively flat with a CAGR of just 2.3% from 2014-2017, which is expected to flatten further to 1.5% across 2018-2021. This is due to the existing level of maturity around ITO in asset management. It’s a trend that is exacerbated by the recent decline in year-on-year profits seen across the industry, driven by the downward push on asset management fees and a movement towards passive investing. On the other hand, BPO’s CAGR of 12.3% from 2014-2017 is expected to continue its impressive growth by a further 10.0% to 2021. BPO growth is being driven by regulatory change and increased client engagement with fund managers. Areas with previously lower engagement have seen increases in demand, putting increased pressure on back and front office processes. The increased transparency enabled by new regulation has driven pressure from customers toward their asset managers and investment advisors to lower their fees. An example of a worldwide trend driving this is the movement away from defined benefit to defined contribution in pension models, driving an increase in demand for fund managers. Some of this front office interaction is being supplemented with robo-advisors, but the increasing pressure on back office processes (e.g. data management, client reporting and transaction management) is driving businesses to outsource these non-strategic processes. BPO providers have also expanded their offerings, allowing FS institutions the possibility of outsourcing a larger range of functions, such as regulation. Wealth and asset managers are unlikely to build up these capabilities in-house due to the expense and complexity of the technology, and the specialist knowledge required in ever-shifting regulatory environments. The increased transparency enabled by new regulation has also driven pressure from customers toward their asset managers and investment advisers to lower their fees. In turn, this is driving companies to look to BPO and process automation to take cost out of their businesses. An example of this can be seen in the 2016 deal between WH Ireland and SEI Investment, who executed a seven year agreement to outsource private wealth management back office operations. In the future, we expect blockchain technologies to increasingly impact this space. Experimentation with blockchain in asset management is probably the closest to gaining real traction. In particular, there are several new blockchain solutions in the transfer agency arena with consortium-led market infrastructure solutions like FundsDLT (built by Luxembourg Stock Exchange-owned Fundsquare) and IZNES (built by SETL) due to take their solutions from pilots to live market solutions in France and Luxembourg this year and next. Several major asset managers are already on board. We expect these new solutions to drive further growth in outsourcing in this space as wealth and asset managers look to take advantage of the opportunities. Similarly to wealth and asset management, ITO growth has declined across capital markets and investment management, and there has been strong growth in BPO. As an industry that has long been a mature user of ITO, market size for these services has actually been in decline for a while, falling to 2.5% CAGR from 2014-2017. This decline has been driven by significant margin compression for investment banks since 2008, whose pressure has been reflected in IT spend as the industry has tried to adapt. In future years, we expect some recovery in the market, with an increase to 2.0% CAGR forecast between 2017-2021. This slight recovery will likely be driven by intensifying competition from new market entrants such as Axe Trading, which enable both buy-side and sell-side fixed income traders to take advantage of fixed income electronic trading. However, similar to retail and commercial banking, many companies now see insourcing as a competitive advantage. CEO, Lloyd Blankfein, has been quoted saying how Goldman Sachs is now a tech company, not a financial services one. In 2015, Goldman Sachs had more programmers and engineers working on tech matters than Facebook, almost a third of their full-time workforce. Goldman Sachs had more programmers and engineers working on tech matters than facebook. in a strong position to jump head first into the IT demands of coming years. The BPO market has seen growth of nearly 16.9% CAGR from 2014-2017 and is expected to continue to grow at 10.0% p.a. up to 2021. This has also largely been driven by competition, cost and regulatory pressures. To keep costs low against the backdrop of increasing competition, many companies are ‘modularising’ their existing operating model, by seeking efficiencies in the front to back model. Outsourcers who are able to swiftly and efficiently assume operational roles – meeting the need to ‘plug and play’ – will be able to capitalise in the BPO domain. For example, within loan administration. In addition, new regulatory requirements for MiFID II and the Senior Managers Regime are also driving new demand for BPO services. MiFID II and the Senior Managers Regime are also driving new demand for BPO services. Market participants are coming under increased supervisory scrutiny and now face requirements to provide a much-enhanced degree of transparency in governance, pricing, costs and reporting to clients and regulators alike. Managing all regulatory reporting entirely in-house can come at a heavy cost due to the complex systems and highly skilled expertise required. Leading services in this space include Bloomberg’s RHUB, a trade reporting product, and Kaizen’s ReportShield, which ensures data quality. The insurance market is undergoing huge transformation as technology and constomer demands disrupt traditional models across the entire industry value chain. In a sector that has somewhat lagged behind banking with regards to adoption of outsourcing services, this trend is predicted to one of the main areas of growth for outsourcing across FS, as shown in figures 17 and 18. Much of the growth in the last few years can be attributed to first-generation outsourcing buyers in the insurance industry (i.e. new services being outsourced rather than existing outsourced operations). Insurance companies are looking to engage with outsourcing service providers to tackle the cost pressure they face as a result of intense competition from new market participants, improve operational efficiency and address regulatory change. For example, Storebrand Group, a large Nordic insurer, sought to improve operational efficiencies, enhance customer experience and drive digital transformation by outsourcing related functions to Cognizant. Under this multi-year agreement, Cognizant is providing a broad range of services across its consulting, technology, business process, and digital capabilities to help Storebrand implement its business strategy, automate and modernise existing IT systems, re-engineer business processes across the customer life cycle, and develop digital platforms with advanced analytics capabilities. Cognizant will also enable Storebrand to move to a Business Process-as-a-Service (BPaaS) model by integrating operations, systems, and underlying IT infrastructure. Insurers are also looking to ITO providers to help them take advantage of the growth in cloud technologies. 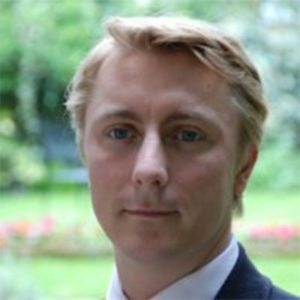 For example, in early 2018 French IT services company Atos announced that they would be entering into a 6 ½ year “significant contract” with UK insurer Aviva. This includes Atos becoming the sole supplier of cross-enterprise data centre hosting services and driving Aviva’s transformation to digital private cloud services. ITO in insurance looks set to continue its growth from 2017-2021, albeit at a slower rate of 3.3% p.a. However, BPO will continue to grow substantially – 11.2% forecast CAGR during the same period. Automation of numerous back and front office processes through AI, RPA and machine learning is driving this growth. Business processes like underwriting, policy administration, claims management and customer service will all benefit from this automation. A recent example of underwriting outsourcing is the deal between Mutual Life Insurance Company and EXL to implement EXL’s LifePRO platform. The agreement encompasses the LifePRO Digital Suite for electronic quoting and application (eApp). This suite includes rules-engine-based automated and accelerated underwriting, workflow, and document generation for all worksite, disability income, life insurance and annuity products. The relationship also includes the implementation of LifePRO for administration and analytics across new business, policy administration, claims and agent support. The uptake of full stack solutions by insurers will likely feed into the continued growth of BPO. 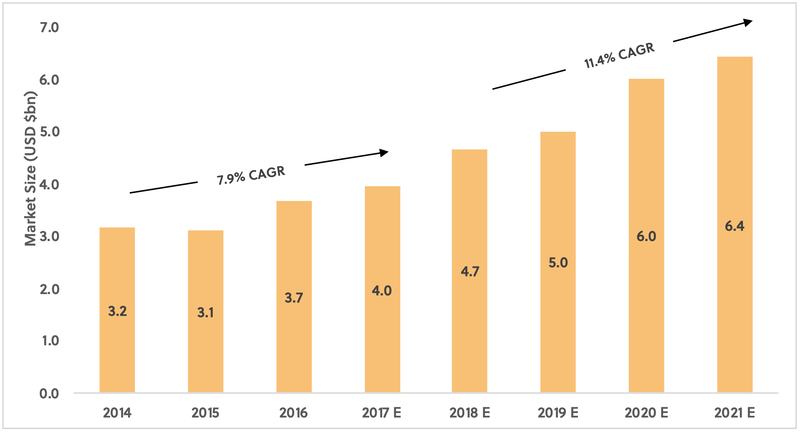 This growth is further explained when considering the impacts driven by domain convergence with ITO, which can been seen in various provider platforms. For example, in 2017 Accenture successfully deployed their Insurance and Annuity Platform (ALIP) at Ohio National Financial Services and is an example of the convergence of ITO and BPO offerings. Their solution provides insurers with new capabilities for product development, new business development, underwriting, policy administration, claims and pay-out. While this product can be provided as an onsite platform, it can also be deployed via the cloud as a selection of customisable modules that can be implemented when needed. The ever progressing regulatory domain combined with the pace of technological development from both a demand and supply side perspective, preserve outsourcing as a key pillar in any strategy that wishes to drive cost reduction, maintain service levels and keep pace in the evolving financial services environment. 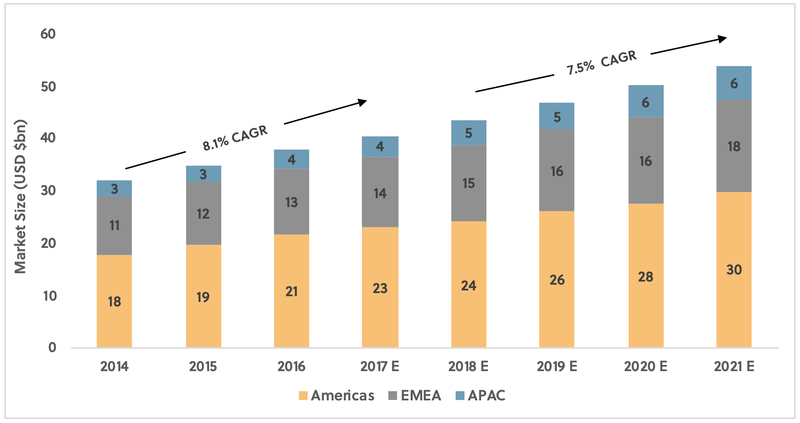 The decline of the mega deal and a movement to a multisource outsourcing ecosystem together with the use of new delivery methodologies has driven a dramatic increase in uptake of consulting services in the industry. Our team has worked extensively across both sides of outsourcing arrangements of all sizes, and we have a proven track record of shaping and delivering the very best deals for our clients, quickly. HI, WE’RE ELIXIRR. IT’S NICE TO MEET YOU. We are proud to have been listed as one of theIAOP’s World’s Top 20 Outsourcing Advisorsfor 6 consecutive years and that the EOA named us their European Outsourcing Advisory of the Year. Our strategic and operational advice combines fresh perspectives and unrivalled insight from our global innovation ecosystem with practical and effective methods of making change happen in practice. We put our money where our mouth is and aren’t afraid to link our fees to the successful delivery of your milestones. Feel free to get in touch if you’d like to find out more about how we can help you with your outsourcing challenges. We’d love to hear from you. You can download the full report Outsourcing-disrupted.